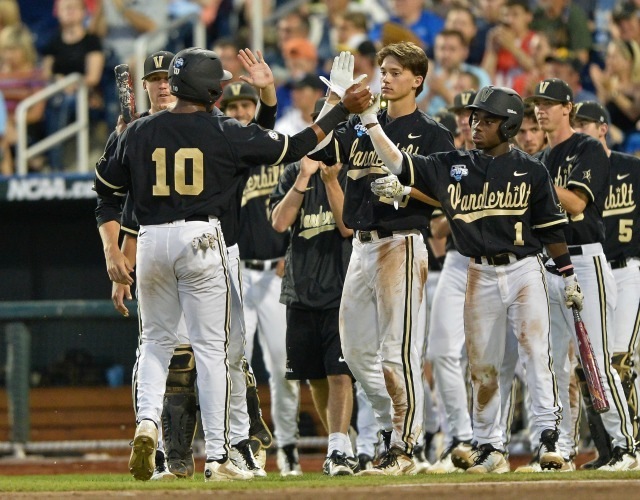 After falling 7-2 on Tuesday in Game 2 of the College World Series Finals, Vanderbilt surged back to take Game 3 and the national championship behind John Norwood's hitting and Hayden Stone's pitching. Norwood smacked a solo homer in the eighth inning to break the 2-2 tie and seal the win for the Commodores. Hayden Stone, who took over in relief of Carson Fulmer, allowed two hits in 1.2 innings to earn the win. Vanderbilt went 2-2 in its only previous CWS appearance, in 2011, before Tim Corbin's squad took the title on Wednesday night. Here are Wednesday's top performers in Omaha. John Norwood turned on Nick Howard's 97 mph fastball and sent it into the left field bullpen to break a 2-2 tie in the eighth inning. It was Norwood's third homer of the year, his first since April 19, and Vanderbilt's first since May 16. It also was only the third home run in 16 CWS games and the 22nd in 72 games by the Commodores (51-21). Hayden Stone earned his fourth win of the year after entering the game to relieve Carson Fulmer. "For two teams to play at that level in the final game with premium pitching, premium plays, premium offense. It was just a lot of fun to watch," Vanderbilt coach Tim Corbin said.